Really like the handles on these eco-friendly duffle bags. Also, they are beautiful. Spacious amount of room and super durable and long lasting. Thanks for the great product. 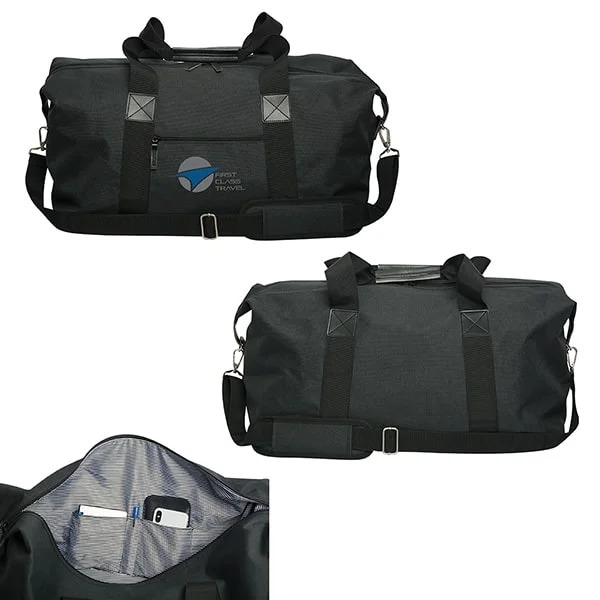 Eco-friendly duffle bags with my companies logo imprinted directly on the center. I travel with this a lot and also recommended it to my other co-workers. My husband and I decided to invest in a product that we thought would help our company grow. This product most certainly did the trick. Thank you so much CEP. These eco-friendly duffle bags are very nice. Custom Earth Promos offer full customization features on all their products. Very durable bag with a spacious amount of interior room. I really like how they are eco-friendly too. Great company to work with.